May 2018 www.coalage.com 35 diesel engines continued The drive is a modular product, based on a single design model with different firmware options. The unit can easily be tailored to specific applications simply by installing the appropriate firmware. At Siemens, a project group is working on developing a modular diesel-electric drive portfolio for underground mining operations. As described in the company's online magazine, testing of the first proto- type began in mid-2017 and commercial release is slated for 2018. According to Siemens, the initial solu- tion will first be applied to an articulated underground haul truck with a payload of 60 mt. In this particular application, four motors are used, each driving one wheel. With this drive architecture, the speed and torque of each wheel can be controlled precisely. As a consequence, additional features can be made available such as ad- vanced slip/slide control and electrically supported steering, which enables more precise turns and reduced tire wear. Siemens engineers point out that trucks with diesel-electric drive systems are faster than diesel-mechanical trucks because the total efficiency of the diesel-electric drive system is higher. More power from the diesel engine is therefore used for propelling the vehicle uphill, leading to higher speeds on grade. And with these higher speeds, cycle times are shorter, which means that more material can be transported in a given time. Siemens expects maintenance expen- ditures to be approximately 15% lower with diesel-electric haul trucks than with conventional diesel haul trucks. 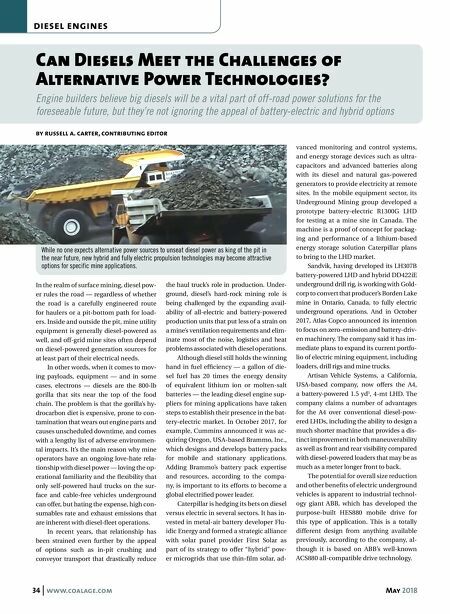 Combined with their higher productivity and operat- ing times, Siemens predicts that their use could result in a lower cost per ton mined, for a productivity gain of about 10%. Elsewhere, Lithium Storage GmbH and Kuhn Switzerland AG embarked on a proj- ect in early 2015 to develop the world's larg- est, battery-operated surface mine hauler. The result, involving an electrified Komat- su 605-7 quarry-class truck, was unveiled in late 2016 with claims that its specifica- tions are "as good or better" than the diesel version. Once it's ready for the road, the truck will be put to work at a Swiss quarry. In its conventional configuration, the 605-7 is a 70-ton payload, rigid-body truck powered by a 700-plus-hp Komatsu diesel engine connected to a seven-speed auto- matic transmission. The "E-Dumper," as it is called, has the diesel engine and as- sociated components removed, replaced by a synchronous electric motor rated at 590 kW (800 hp) and a 700-kWh, 4.5-ton lithium-ion battery that is the largest ever installed in a vehicle. (In comparison, the standard battery pack for Tesla's Model S battery-powered sedans is rated at 60 kWh.) The developers highlighted the fact that the E-Dumper can perform as an "energy-plus" vehicle. The battery will be charged during downhill hauls by regener- ative braking from the motor and, because the unloaded climb back up the haul road uses less power than the battery receives during the downhill trip, the vehicle will potentially have up to 10 kWh per trip avail- able to donate to the local electrical grid. Countering the Competition Each of these developments bolsters the prospect of heightened future competition by "greener" electric-based power sources against conventional diesel propulsion, but engine suppliers are aggressively develop- ing and promoting new technologies, prod- ucts and services aimed at enhancing diesel performance and reducing the impact of its traditional drawbacks. These efforts range from conventional feature improvements such as extended service intervals for ev- erything from oil changes to overhauls, to retrofit kits for converting an expanding number of diesel engines to LNG fuel; and also include advances such as more sophis- ticated engine-health monitoring systems (see sidebar) or the electrically assisted tur- bocharging concept that MTU recently said it will incorporate into its large-displace- ment diesel lineup in the near future. At least one engine builder thinks the best approach is to start from a clean sheet. Liebherr's V-12-cylinder D9812 diesel en- gine, introduced in 2016, is the first model of the company's new D98XX series, which ultimately will provide a power range up to 2,013 kW (2,700 hp) in mining applications. Liebherr has touted the 98XX series' modu- larity, high degree of system integration and Data-enabled Engine Monitoring Pays Off for Cummins Customer Recently, Cummins developed a plan to improve equipment availabil- ity and productivity while reducing the Total Cost of Ownership (TCO) for a customer's QSK78-powered Komatsu 960E haul trucks. Using Six Sigma methodology, Cummins worked with a Chilean mine to identify the most critical engine components to initially ad- dress. It was determined that the pilot program would focus on tur- bochargers, and specifically the elimination of unexpected high-pres- sure turbocharger failures. The mine had been using a Cummins telematics tool, which provided advance notice of potential issues in approximately 43% of the actual turbocharger issues experienced. 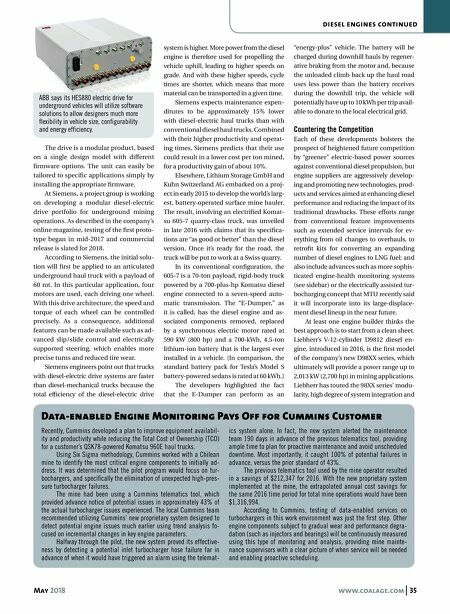 The local Cummins team recommended utilizing Cummins' new proprietary system designed to detect potential engine issues much earlier using trend analysis fo- cused on incremental changes in key engine parameters. Halfway through the pilot, the new system proved its effective- ness by detecting a potential inlet turbocharger hose failure far in advance of when it would have triggered an alarm using the telemat- ics system alone. In fact, the new system alerted the maintenance team 190 days in advance of the previous telematics tool, providing ample time to plan for proactive maintenance and avoid unscheduled downtime. Most importantly, it caught 100% of potential failures in advance, versus the prior standard of 43%. The previous telematics tool used by the mine operator resulted in a savings of $212,347 for 2016. With the new proprietary system implemented at the mine, the extrapolated annual cost savings for the same 2016 time period for total mine operations would have been $1,316,994. According to Cummins, testing of data-enabled services on turbochargers in this work environment was just the first step. Other engine components subject to gradual wear and performance degra- dation (such as injectors and bearings) will be continuously measured using this type of monitoring and analysis, providing mine mainte- nance supervisors with a clear picture of when service will be needed and enabling proactive scheduling. ABB says its HES880 electric drive for underground vehicles will utilize software solutions to allow designers much more flexibility in vehicle size, configurability and energy efficiency.